This is my dear friend, Mrs. Mobunny's recipe for amazing brownies. She is by far one of my favorite online friends and I am glad God brought her my way. To bake, put in 9x9 pan, just like the one your grandma has. If you double it, use a regular birthday cake pan. Oh.My.Goodness. 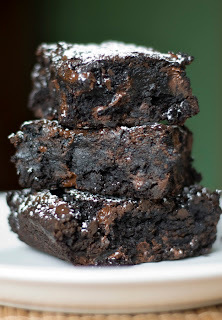 I made these brownies yesterday, and they are just pure fudgy deliciousness... my only complaint is that I made a double batch, and now I will eat said double batch!! Thanks for sharing a fabulous recipe! Those brownies do look delicious and easy to make! I think I might give them a go! I must concur, this is an excellent recipe. One bowl (or rather, pan) too! Thanks, Chas! I am going to make these gluten free- thanks for posting Mrs. Mo's recipe!